It seems there were two brothers by the name of Jones. One was married & one was the proud owner of a dilapidated row boat. Just then the old lady fainted away. So a long time ago, in May of 2003, I started putting jokes on this website. 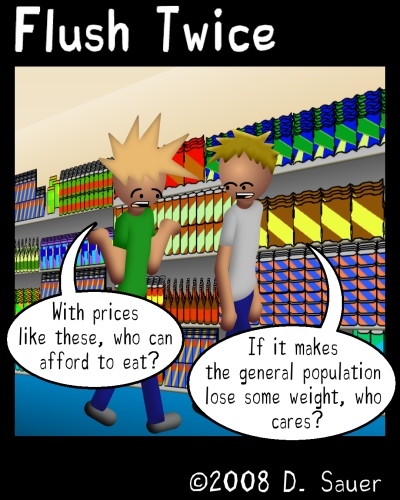 Less than a year later in January of 2004, I started putting up a daily panel comic. Shortly after I created a template I could use to upload the daily joke and comic- A kind of do-it-yourself content management system if you will. Back then, updates were handled via ftp (file transfer protocol), and the web server was literally in my basement. Occasionally my home IP address would change, and I’d have to log into a DNS server and update that info so people could connect with my website again. In the fall of 2005 I joined the Army, and I wasn’t home to watch over the server, so the site went offline right after I left. During “Christmas exodus” I signed up with IX Webhosting to bring the site back online, and kept doing what I had been doing until this date. So in late October of 2008, I realized that my web host could support a CMS (Content Management System). Of course they were able to do this all along, but the thought had previously never occurred to me. I started playing around with it, and at first I installed Moveable Type. That wasn’t really working out for me, so I switched to WordPress. The thing is, everything thing I had done… All my work from May of ’03 to October of ’08 somehow managed to get deleted. Oh, I could find scraps of it here and there, but there was never any October 21, 2008 backup of Flush Twice. If it wasn’t saved on the internet archive site, it was gone for good. 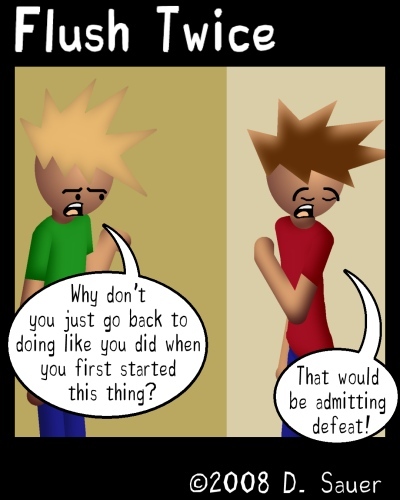 On the bright side, it meant I could re-use all those jokes again, but it still makes it look as if Flush Twice and it’s comic hadn’t started until 2008, when Flush Twice has actually been around since 2003. So that’s why we can’t go back. There’s nothing to go back to.